Dean Clifford was not expected to live past the age of 5. He was told by the age of 10 that he would never walk again. Dean was told there was no chance he would ever “fit into society” or work. Dean has turned every negative into a positive to not only defy all the odds but to rewrite all the rules along the way. Dean has not just survived, but found a unique and amazing way to thrive under extreme adversity he faces every day to achieve more than anyone could ever imagine. Dean is very passionate about motivating and inspiring all by sharing his amazing life story to empower his audience. He challenges them to dare to dream and believe in themselves, to chase their dreams and achieve as much as humanly possible. What is so amazing about Dean Clifford you may say? Simple he is a survivor! Dean was born with Epidermolysis Bullosa which is commonly referred to in the media as Cotton Wool Kids / Butterfly Children or the abbreviation E.B. Dean’s life is one of extreme pain and hardship, yet he has never wavered from his own dreams to be a productive member of the community working and contributing in a meaningful way. Dean was also the Face and voice for Disability Employment in Australia which saw Dean inducted into the Disability Employment Australia Hall of Fame for his outstanding work to raise awareness for people with disabilities seeking for-filling mainstream employment all over Australia. Dean is currently an Ambassador for the Brisbane Broncos Football Club, as well as a spokesperson for E.B Awareness. If that is not enough in early 2004 Dean took up the hobby and challenge to become a Powerlifter in his spare time. This has seen Dean be worldwide regarded as one of the strongest powerlifters in his weight class. Amazing for someone who’s skin is still medically regarded as being as fragile as tissue paper and rips apart at the slightest touch. You definitely have to hear Dean speak at least once in your life. “As a motivational speaker I am not about smoke and mirrors. I am not the cliche speaker that is going to get everyone up on their feet walking over hot coals or broken glass. CREATING LIFE CHANGING EXPERIENCES AND LONG LASTING MEMORIES IS WHAT MOST PEOPLE ARE SEEKING IN A SPEAKER. I feel very lucky and honoured to be in the position that I am as a Motivational Speaker. My story has universal appeal. I am not just an “after dinner speaker” or a “Corporate speaker” or a niche speaker. All my presentations are based around my life experiences and are tailored and modified to have maximum impact. No two presentations are ever the same. To date I have travelled the world speaking to small classrooms, Primary School students / High School students and Universities including large High School Graduation Ceremonies. Small and Large Charity Fundraising Events. Small Business events including staff business meetings and business networking events. Large Multi National Business Events through to Conferences and private one on one meetings with Government Departments and Prime Ministers. What ever event or group you can think of it is highly likely I already have a letter of recommendation or letter of appreciate for sharing one of my presentations. One sign that the audiences like what I am doing is by just how many repeat booking requests I receive from a number of schools, businesses and conferences. Some of whom have booked me every year for 6 or 7 consecutive years. The goal has always been to have a meaningful impact on everyone who listens to my story no matter the age or position they are in. Feel free to peruse my Reviews page for just a small example of some of the hundreds of letters of recommendations I have received over the years. DEANS STORY IS MOVING, MEMORABLE, LONG LASTING & LIFE EMPOWERING. EVERYTHING YOU COULD HOPE FOR IN A SPEAKER. Thank you for the privilege and opportunity to be the beneficiaries of your presentation titled “Dead Man Working” on Monday evening at our formal dinner. As you are aware, the AFP Brisbane Office took the opportunity amongst a period of constant work and demands to capture our Team Leaders and give them the opportunity to leave the daily coalface behind and focus on the more strategic issues impacting on the work they do. Our three day forum in Maleny was a chance to draw breath and consider the future. Our Team Leaders are t he critical first line managers in our organisation. Whether they are steering major organised crime investigations, investigating tragedies such as the Bali bombings or ensuring our security here in Australia they often find themselves faced with challenging and demanding situations. On Monday evening I witnessed them viewing life from a different paradigm. Your presentation was more than motivational and far more than inspirational. You embodied the ultimate goal of human endeavour and your life story took us all to a new dimension. The challenges you constantly encounter made our daily grinds pale into insignificance. Your courage, determination and “never admit defeat” attitude demonstrated to all present that your life’s purpose is to convey a very special message. I can tell you that this group of very life hardened police members and staff could not stop talking about the positive impact your presentation had on them, both personally and professionally. You put the vagaries of life into a very special prospective. Thank you very much for the time you spent with us. You are a very special man and as the great Broncos’s ‘hardman’, Shane Webcke so beautifully stated, you are a “National Treasure”. For/and on behalf of our AFP Team Leaders in Queensland. Thank you for the opportunity to travel with you recently and to hear your talk in Kingaroy. I was very impressed with your presentation and appreciated the opportunity to learn more about your background and your approach to making the most of every day. Your willingness to share your experiences so openly with others is to your great credit. The audience certainly responded very warmly to the positive messages of hope and perseverance you offer in your story. Your motivation to succeed in work and in your personal life and to give something back to the community, despite the obstacles in your way, shines through in your presentation. I am confident your presentation would have wide appeal to a number of audiences. I believe your blend of humour, honesty and enthusiasm would appeal to both community groups and corporate clients. I wish you every success with your work in encouraging others to make the most of what life has to offer. I am writing to invite you to speak at the Prime Minister’s Employer of the Year Swards to be held in the Great Hall, Parliament House, Canberra on Thursday, 1st of December 2005. As you are aware, the Awards are an occasion to acknowledge those employers who have shown leadership and innovation in creating employment opportunities for people with disabilities. I would welcome you speaking on the night about how work has transformed your life and the nature of the support that Ken and Sheryl, and your colleagues, have provided. At the moment, the schedule of events for the evening is still being determined. My office will be in touch with you shortly to confirm your availability and to discuss the exact timing and the requirements for your talk. My office will also arrange for your transport and accommodation for the event. I trust you will be in a position to accept this invitation. 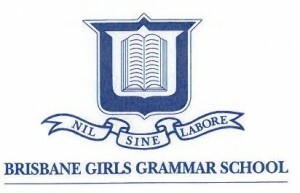 In 2008, Brisbane Girls Grammar School invited motivational speaker Dean Clifford to speak to all the girls in Year 10, 11 and 12. Dean’s presentation was truly inspirational on many different level. During his talk he described for the girls his very rare and severe lifelong medical condition, Epidermolysis Bullosa, and through this shared with them the challenges that he has faced since his very early years – the endless operations as a young child through to the daily ritual of managing his life successfully. He explained how, as a baby he was given only four year to live, and now at the age of 29, has overcome an enormous number of obstacles including discrimination and exclusion. He focussed strongly on the setting and achievement of goals, and how he has overcome his physical challenges to achieve some outstanding milestones in his life. At the conclusion of each of his talks, the reception given to Dean was heart-warming and extremely affirming, with the audience spontaneously and unanimously joining in a standing ovation and sustained applause. Perhaps the real impact, however, came after the event. Since Dean’s three presentations, many girls have expressed a real appreciation for what he had to say, often using parts of his story to relate to the challenges they themselves face in their own lives, and many expressing heartfelt appreciation that they now have a more global perspective on life, and a better understanding and appreciation of the challenges faced by those less fortunate than themselves. A number have made the comment that hearing Dean speak has been the most impactful experience they have had. Dean Clifford comes to you with my unqualified recommendation. I am certain that your older students can derive a very significant benefit from hearing him speak. If I can be of any assistance to you, or can provide further details with regard to Dean’s work, please do not hesitate to contact me. I have known Dean (Deano) for over seven years now and we have been close friends for at least five of those years. During that time I have got to know him very well and have watched him overcome many obstacles to develop into the person he is today. When I first meet Deano he was restricted to his motorized scooter (wheelchair) because of the pain he endured and over time the lack of muscular strength in his legs made him too weak to walk. Over the past seven years most of my team mates at the Brisbane Broncos and I have watched Deano overcome the odds and obstacles that had been put in front of him to become a very respected and valued member of our society. He is also a great friend and loyal supporter of the Broncos in general. I have been fortunate to witness Deano’s amazing progression from him relying almost totally on the use of his wheelchair, to him now walking again. 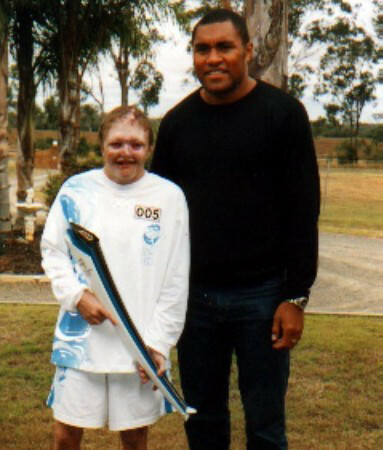 This transgression led to one of his life’s more memorable moments in the year 2000 when he was handed the Olympic torch and walked the 600m leg of the Olympic Torch Relay just outside of his hometown of Kingaroy. Deano has continued to live his life to its fullest and has never let an opportunity pass him by and it is this positive outlook on life that is obvious to everyone who spends time with him. Deano is someone who does not ask for sympathy, only respect and to be treated the same as everyone else. This past year or so, close family and friends have noticed a dramatic change in Deano’s persona. He is now very confident, in control of every situation and very much a role model to those around him. This, in my mind, has been due to the fact of his job at Ken Mills Toyota. Deano has become very involved and an important member of the dealership and is a person who truly loves his work. The confidence he has gained at Ken MIlls Toyota has led to Deano aspiring to become a motivational speaker and releasing a book on his life story. He has benefited greatly from the opportunity and appreciates being a part of such a flexible team, which allows him to work from home when he is not at his best. Ken and Sheryl Mills have been very supportive and have become aware of the qualities that all of his close friends already know Deano possesses. I do not see Deano as having a disability. It is those who judge him from the outside who do not understand what a truly remarkable and inspiring person he is. He is a very mature and ambitious young man, and is someone who I am very fortunate to call a friend to know and trust. It was the NRL’s privilege to have Dean Clifford as one of the speakers during the Toyota Cup induction camps. These camps are designed by the NRL to help young players become not only better players, but better men. We are approached by numerous speakers every year, the majority of which we turn down as we are very selective in this process. However when Dean made himself available, we jumped at the opportunity to have him speak. The talk given by our guest speaker is often the highlight of the camp, well it was in the case of Dean Clifford. I can honestly say we have never had anyone speak with more vulnerability, courage and passion. His ability to draw from his experience’s and speak from the heart, gave our young men a greater perspective on life, and how a new motivation to live their life with greater purpose. After Dean’s talk, he sat down to chat with the players along with former Origin great Gordon Tallis who also spoke at the camp to impart his knowledge. The team of young men that stayed behind were glued to both Gordon and Dean as they stayed for hours and gave above and beyond the time required. It would be my honour to recommend Dean Clifford, he would be of invaluable service to any school or organisation. Dean Clifford and I first met at a football match in Brisbane. We briefly spoke that night but not at any great length. During my drive home that night, many questions went through my head, none more so than Dean’s outlook on life and what drives him. I subsequently phoned Dean and had a conversation with Dean where he informed me about his motivational speaking. Taking these thoughts away I decided to invite Dean to speak at one of our monthly off site management meetings. On the 8th Aug 2007, Dean ventured to our off site meeting. On the agenda I had listed a mystery guest speaker, preferring to create a sense of curiosity around the day. We started our morning with some department updates prior to Dean’s arrival. At around 11am Dean arrived which worked in well with our days plan. On entry, Dean was introduced to the management team who were all a little taken back by his arrival, as I think most were expecting a sports star or the like. Without any hint of being shy or holding back Dean took over from there. Setting up his presentation that screened in the background while he spoke, he maintained such a keen intent audience. At the end, Dean answered many questions and joined us for lunch where questions continued throughout the break. At the end of lunch, Dean left us and we thanked him greatly for his time. During the afternoon session out initial discussion was about our time with Dean. The management team were amazed at his outlook, positive nature and saw how much can be learnt from his life’s view. It was agreed at that time a letter of recommendation would be written and sent to Dean. The management team agreed that Dean’s approach was different, not the usual motivational speaker you may have. He is not someone who has made millions of dollars or carried out some amazing sporting achievement. Dean’s achievement is being able to smile at all life has delivered to him, something we can all learn from. There is always a way to move forward. We thank you with great appreciation and wish you all the best in your chosen path in life. Also, we acknowledge you live your life how you want on your terms and not those dictated to you by others, for this is where your strength is and your commitment of life enjoyment. Keep your smile and all the best for the future. March this year (2005) I was very fortunate to attend a business conference in which Dean Clifford presented his story “Dead Man Working”. It was an extremely thought provoking and moving presentation of Deans life living with EB and the daily challenges he has faced to get to where he is today. It is a presentation worthy to be heard in any environment from school children, staff motivation workshops, conferences, to the corporate elite. Dean is a very professional and natural speaker, mixing the serious issues that he faces with EB with his good humour making for a very personal and entertaining experience. Dean and I have shared a friendship for 10 years. In this time I have watched him develop from a very unwell teenager to the man he is today. Although Dean has faced many physical and emotional challenges throughout his life, he has never let it stop him from living life to the full. He has always been extremely optimistic and positive, and determined to live life, like any other young man. As a person who has played professional sport, Deans message of perseverance, determination and humility, has had a powerful effect on me. It reminds me to keep a clear focus on my goals, and appreciate others who have a tougher road them myself, yet still achieve. To try and live every day to the full, appreciating my health and not taking it for granted. Seeing the way Dean has impacted many people around him, it is a tribute to his character and to that of his family. It has been my honour and privilege to know Dean personally; I hope that others have the same opportunity. Dean is not a sporting hero or the Demtel man, he does have an amazing story of life’s struggle from a perspective that not many could imagine or handle. He is courage personified and I only hope you may have the opportunity to find this out. Many believe Dean is a National Treasure. **** Dean has Epidermolysis Bullosa (EB) or more commonly referred term a, Cotton Wool Kids. The term kids is used due to the fact that those with this genetic disease do not live past childhood. This is a tragic and debilitating disease with no cure, usually containing an early death sentence. Dean has baffles medical science with his survival and his struggle for life. There are many from all walks of life that can learn a great deal from this young man. Dean is now 26; he was not expected to live past the age of 5. Dean’s day is one filled with incredible pain and hardship, none of which he allows to impede the pursuit of his dream. Motivational speaking, sharing his life story, thereby inspiring others to dream and to believe in themselves. Dean is an ordinary bloke with an extraordinary gift, you will never look at life in the same way again. Dean’s journey as a Motivational speaker started simply and honestly, he is committed to helping others through his own personnel experience. This was not intentional —-it is a gift he has and if you allow yourself the opportunity perhaps the emotional roller coaster –that is Dean’s life will inspire you as much as it has inspired thousands already! You owe it to yourself and your company, in fact you deserve Dean! I hold this philosophy very strongly, I believe I am a better person and you will be as well by taking this chance to witness what Dean has to offer. By the way Dean is also the Face of ACE”, ACE is Australia’s Disability Employment Service Peak Body; promoting awareness within Australian business communities ‘Possibilities for People with Disabilities’, Dean is their National Ambassador. 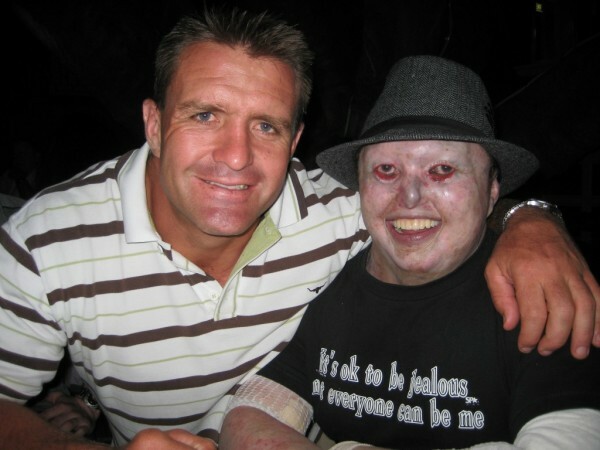 Dean is also the Good Will Ambassador for the Brisbane Broncos and a spokesperson with DEBRA (Dystrophic Epidermolysis Bullosa Research of Australia) he has his own company DMC Motivational and in his sphere he is the Business and Marketing Officer with Ken Mills Toyota. Not bad for a guy that calls himself (and his presentations) Dead Man Working! Dean is a truly amazing and remarkable man. To walk a mile in Dean’s shoes and maintain the composure and zest for life Dean has is beyond most mere mortals. Yet he shares openly and willingly urging others to dream and to believe in themselves! Dean’s story is powerful, moving and empowering, an audience is taken on the emotional roller coaster –that is Dean’s life! Dean sharing his story is life changing and makes one look seriously at life and what we all take for granted. I know Dean has something unique and special to offer groups, corporations and business, simply by telling his story! Dean’s Presentation is titled “Dead Man Working”. He modifies the presentation to cater to all speaking requirements, from Keynote presentations to whatever the company or conference may require. The feedback from schools, universities, small, medium and large businesses as well as Cooperate functions and Government functions suggest Dean is going to be in high demand. I thoroughly enjoyed your presentation at the Hilton Hotel, Blackpool, UK. You are an inspiration to all, a natural speaker and you did this for 1 ½ hours without notes – amazing!!!! Good luck in all you do, keep up the gym work and we hope to welcome you back to the UK soon. 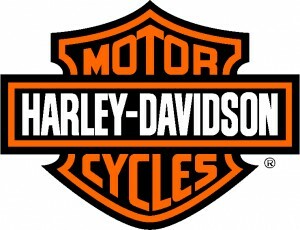 Dean Clifford was hired to give an inspirational talk at our annual ‘Harley Owners Group Officer’s training’ in Cairns August 2012. Without seeing Dean’s presentation before I wasn’t sure of his structure and was a bit nervous of the outcome. Without doubt I would have to say Dean’s presentation, was one of the best I have ever witnessed. He would admit our crowd was a tough one to conquer. However nearly 200 members in the room where memorized and in awe of a wonderful man that is Dean Clifford. I would highly recommend him to speak at any conference or event. He is an amazing story teller, has achieved amazing feats in his life and will leave people he meets in amazement. Thanks Dean for coming along to our event, I would have you again at a future event any day. It was a true privilege to have you recently present your inspiring message of perseverance and determination to the Youngcare Board and staff. Here at Youngcare, we have a number of values that guide our mission of helping young Aussies live life with choice, independence and dignity. Your captivating journey and the path you’re now travelling epitomises many of these “non-negotiables”, in particular the Youngcare Guts and Optimism we aim to embody. Your insights into the ways you tackle life’s highs and lows have left a lasting impact on all who listened to your thought-provoking presentation about constantly “raising the bar”. We greatly appreciate your time with us, and couldn’t recommend you more highly as an engaging and powerful presenter who speaks honestly and from the heart. Your commitment to hard work, self-belief and unwavering positivity is nothing short of inspirational. 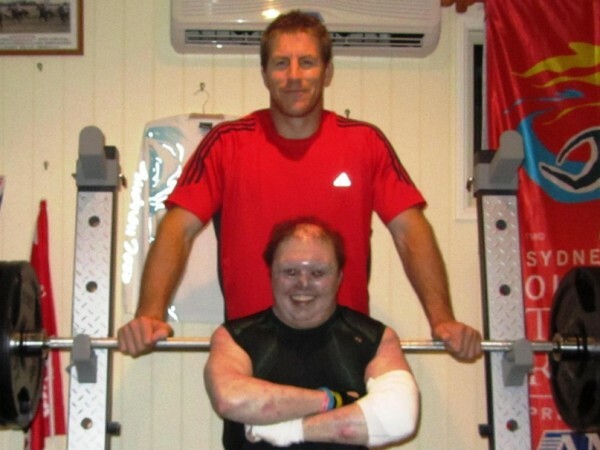 In 2006, Dean and good friend Brad Thorn (Former Brisbane Bronco and New Zealand All Black) were talking about what Dean could do to build his physical strength and improve his overall health. What they uncovered was truly amazing. Even though Dean’s skin is incredibly fragile and delicate, internally Dean had the heart and mental strength of an elite athlete. Under the guidance of both Brad Thorn and Dan Baker (world renowned power training coach and good friend of Deans. Find Dan here www.danbakerstrength.com) the three of them began working out a program designed around protecting Dean’s skin yet also build his strength and power. The results have been beyond anyones expectations. Under Brad and Dan’s guidance Dean has transformed his life from being incredibly weak and unwell to now being one of the strongest and healthiest people you will ever meet. Today Dean trains 4 times per week and is regularly achieving a new bench pressing record. Diagnosed with a rare genetic skin condition 18 months after birth and given two years to live, He is the oldest living survivor in the world with the most server form of Epidermolysis Bullosa. Despite horrendous obstacles, he has continued to rise above challenge after challenge and lives daily with the painful consequences of his skin Condition. Yet he is joyful and positive!